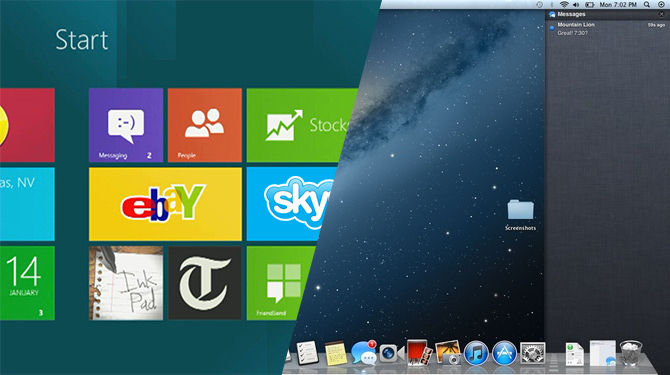 In February Microsoft's upcoming individual consumers Preview Win8 operating system, Apple also lonely, low-key launch of next-generation operating system, OS X, Mountain Lion developer preview on February 16. Resurgence smoke after a lapse of three years after the dispute between Microsoft and Apple operating systems. And this, whether it is Microsoft or Apple, all without any intent to make its own operating system development, that is, move in one direction.Expressed, Apple is the Mac more like the iPhone as Apple CEO Tim Cook Tim Cook interview. Microsoft, Windows Phone simply merge to into Windows8 operating system. So, in this mobile operating system battle, who would come out on top? February 16, Apple officially launched a developer preview version of the Mac operating system OS X, Mountain Lion, and this distance, the Mac operating system Lion released just seven months. Meanwhile, the Apple product marketing Phil Schiller, senior vice president, said in an interview, the official release time for the late summer of this year. Perhaps Apple will once again become the leader. As early as in the Lion operating system released in July last year on the use of some of the features of iOS such as used in high-end gesture control and the icon grid display so from the iOS. This time, add the action to integrate iOS function amplitude, Apple did not tiptoe's done a lot of major changes. 1. ICloud: Mountain Lion, from the outset with the iCloud, which reset the Mac very convenient, whether it is stored in the iCloud the iPhone, iPad or iPod touch document, you can quick access to the Mac. 2. IMessage: iMessage replace the original iChat by iMessage can at any time from the Mac to send information to the iPhone and the iPad, iPod touch or other Mac. Remind applications: application to remind the user to follow up the iPhone, iPad, the iPod touch and the latest Mac-Do the best way. The iCloud you can advise and list update to all Mac, the iPhone, the iPad, the iPod touch and PC. Create a reminder, it will automatically update available on the user's Mac. Edit the list of tasks on your Mac can also be automatically updated to the iPhone remind above. (4) Memorandum of Memorandum of Understanding: the iPhone and the iPad application can be easily allows users to record important information at any time. The iCloud same convenience to users in a timely manner to the memorandum records updated to all devices.Memorandum record of the various forms created on the Mac when the user starts the iPad memorandum application automatically modify a "memorandum of record" in the iPhone also get timely updates in the home Mac. The gradual integration of these functions, the computer using the Mac user experience will gradually close to the iPhone and the iPad user, so that we can see that the Mac operating system, mobile development is gradually forward. The Mountain Lion operating system's release, we also saw a change that is Mac OS X has officially changed its name to the OS X. While Apple is still in the PR information to said Lion system for Mac OS X, but in the Lion's website introduction page and the Mac, the App Store page, Apple has started using OS X Lion this new name. Of The Verge reported, Apple has officially introduced in the Mountain Lion, product pages and PR information to remove the Mac character. Lion has been published in July last year, we can see that the Mac OS is gradually soft iOS function, iOS is based on Mac OS X-based systems, there are many similarities between the two, completely remove the Mac character, is not to imply that both eventually be able to converge, to create a truly mobile operating system, it is not known. The dominance of Windows in the desktop-class operating system on this site, or worry in the present situation, but with the potential from Andrews and iOS, mobile devices, a great alternative to the trend of the PC, Microsoft will have to re- consider their own development strategies. The new launch of Windows 8 Microsoft's high hopes, Microsoft hopes to be able to take this opportunity to restore some status in the mobile platform. Windows 8, Windows 7 and Windows Phone 7 are two different operating systems, Windows appears, Microsoft directly to the Windows Phone incorporated into the former. In order to create a new generation system, Windows 8 operating system the biggest advantage is you can run on the PC, tablet PCs and smart phones dominate the future of the so-called "screen" (PC, tablet PCs, smart phones, smart TV the world of game consoles, etc.) to give the unified experience of the user to seamlessly switch to accelerate the move of the layout of the operating system. Metro was originally used by the Microsoft Windows Phone 7 interface design language.Windows 8 formally adopted by the Metro style interface specifically designed for touch, important information can be displayed to the user, and the interface supports both a mouse and keyboard, so that Windows 8 build can be applied to the mobile phone and tablet device operation The strategy of the system. Apple iOS and Google's Android in the mobile Internet era shine, these two systems are based on the ARM architecture. Microsoft's mobile road also choose to support the ARM architecture, select the front face of competition from other two systems. Windows 8 has not yet officially released, Microsoft did not give the exact date, but the big screen "in Microsoft strategy for concern for many developers. Developers will be applied from the Windows Phone ported to Windows 8 on the platform process, only 10% of the difference between Windows 8 and Windows Phone. This will more Windows Phone application developers can easily transition to Windows 8 platform application development.With the ARM platform support for Windows 8 operating system and future trends, the commonality between the PC and mobile products will be more powerful, Microsoft developers are happy to see such a change. The operating system mobile battle edge? Although the two companies have released their new version of the operating system, and are mobile on the road has taken a large step, but because of the chosen path difference, policy differences, the two companies in the process and some different. Apple's new system, Mountain Lion, the Lion on the basis of a larger reform, mainly into the more perfect iOS features to attract users in the Mac operating system, in order to expect Mac users to the Mac the system more user experience with the iPhone, iPad. CSDN "programmer" editor-in-chief Liu Jiang said: "It seems Apple, iPad , the iPhone is the future, although the Mac but also the development of, but will just add, so focusing on the Mac iOS users better with the integration of cloud the first interface, it is not fusion, but draws in part on at least the medium term, iOS and OS X is not fully integrated plan. " The other hand, Microsoft's own dominance in the PC market advantage, so in order to avoid weaknesses, "On the one hand, to use their desktop advantage to invade mobile phones and platforms from the desktop; the one hand, to get Windows to modernization (interface, support for ARM The hardware architecture). two have a great risk in the operating system level is basically to use an OS to go-take-all. "Liu Jiang pointed out. This is a completely different with Apple's development path. Right or wrong, I is not good to jump off on the. No matter who would is unique in the mobile operating system on the road, or is evenly divided, our users, there is a suitable operating system for a better user experience is king. The result of this struggle, we will wait and see.